As first reported by Mac Stories, Apple just released its official WWDC app on the App Store, which is free, but only available for attendees. 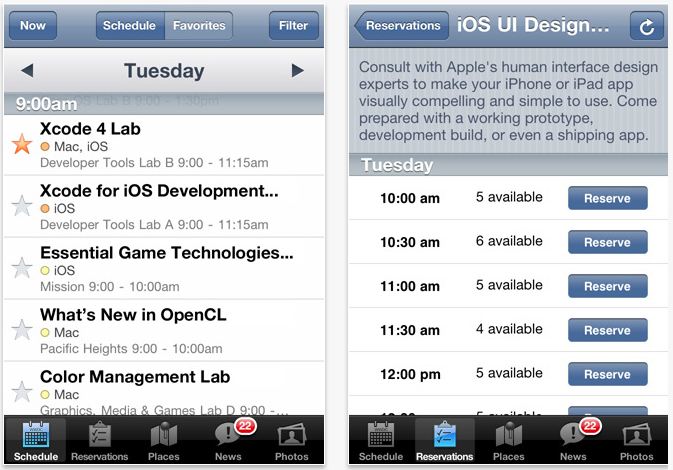 The WWDC 2011 app acts as a mobile guide to Apple’s upcoming Worldwide Developers Conference. The app includes conference information and the ability to make a reservation at the User Interface, App Review, iTunes Connect, Program Support, or Developer Publications lab. Use the app to view floor diagrams of Moscone West, where the conference is being held and use it to create a custom schedule of the sessions, labs, and events you plan on attending. The app works for both the iPhone and iPad, unlike its iPhone only version last year. If you are attending, download it here in the iTunes store. Read next: Photos on Twitter are live. Here's how they look.